Dr. Nuray Yurt clattered tea cups from the table and excused herself from the dining room. She held the tiny glasses, clear, smooth and familiar, and placed them beside the sink. She adjusted her headscarf and after a few moments of quiet prayer returned to the table where her Muslim family and eight Christians from Hackettstown Trinity UMC were seated with full stomachs. Late on Friday night, June 24, at a cozy home in Cedar Grove, Yurt’s annual Ramadan dinner was joined by new friends, United Methodists of Greater New Jersey. Part of Trinity UMC’s small group “God in Many Faces,” the eight worshipers from Trinity accepted the generous invitation to experience the Ramadan Iftar dinner after weeks and months of reading, studying, and learning about Islam while building relationships with Yurt and other members of the interfaith bridge-building nonprofit, Peace Islands Institute. The non-religious, peace-centered group was first introduced to Trinity members at Chatham UMC’s Abraham’s Table luncheon in January. Addressing a range of topics of interfaith dialogue and global peace outreaches, the gathering brought together Christians and Muslims under the umbrella of exploring issues of concern together. There, a pledge was signed to challenge bigotry in any form and stand up for each other. For the members of Trinity’s “God in Many Faces” small group, the luncheon inspired discussions, studies, and relationship building between Muslims and Christians. For 27 years, Chatham UMC Pastor Jeff Markay has worked to build intentional interfaith friendships. After September 11, 2001, Markay said it became “painfully clear” how important bridge building with the Muslim community would be. A few years later, Markay met Dr. Levent Koc Executive Director of Interfaith Dialogue Center, which later became Peace Islands Institute. Abraham interfaith lunches were hosted at Caldwell UMC, where Markay pastored for 12 years. “I was close friends with a Roman Catholic priest, a conservative rabbi, and Dr. Koc and his colleagues in the Islamic faith,” Markay said. “We did a lot of shared ministry projects, meals, and bridge-building events together over the years.” Markay served as a speaker and emcee at some of the award dinners and Iftar dinners hosted by Peace Islands Institute and has held Abraham luncheons at Chatham UMC for the past 3 years, hosting over 100 people from various faith traditions at each event. For Trinity UMC, the idea of interfaith dialogue took a step forward in the summer of 2015 when Pastor Frank Fowler led a ten week class on Christianity and Islam. “The class was a helpful next step in Christian and Islamic thinking,” said Fowler. “It challenged us to think in better ways about the Islamic community, to learn about our own faith, and the Islamic faith.” One of the challenged was Tammy Bormann, a professional facilitator on multiculturalism and anti-racism consultant with 27 years’ experience in social justice education. A few years prior, Bormann started the “God in Many Faces” small group at Trinity, emphasizing race, ethnicity in community, church and society. The group studied books, articles, documentaries, and a wide range of sources to guide, inform, and inspire dialogue on how to respond to racism as Christians. After the Chatham UMC luncheon, Bormann’s small group members began a relationship with Peace Islands Institute in an effort to better understand Islam. Using resources from Fowler’s previous summer study, the group began to dig deep. Dr. Nuray Yurt, Peace Island Institute Director of Interfaith Affairs heads up the New Jersey branch of the organization, and has found United Methodists to be very open. 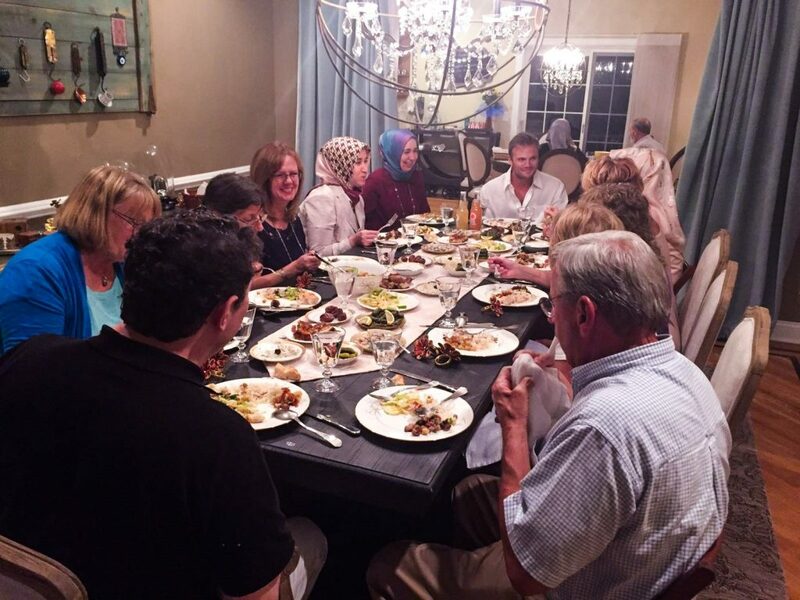 After reaching out to Pastor Fowler, Yurt extended a gracious invitation for the small group members to join her and her family at their home for their Ramadan Iftar dinner. For Muslims, Ramadan is a month of fasting during the daylight hours, identifying with those without food and clean drinking water and engaging in deeper, more thoughtful prayer and meditation. Each night the fast is broken with a special dinner known as the Iftar. Yurt, who was “delighted” to host her Christian guests said,“It will be a time for us to get to know each other and become acquainted on a first name basis.” Humbled by the effort of the group to step outside their comfort zones for what she said was “the benefit of humanity” Yurt expressed excitement. Months of studying, reading, and discussing led up to the tangible experience. As Muslims, Yurt and her family fulfilled a requirement of their faith by inviting their newfound friends to Ramadan while the Christians from Trinity practiced their faith through a loving, accepting and open-minded willingness to learn from those of different beliefs and cultures. Upon entering the Yurt’s home, the guests removed their shoes and introduced themselves in the living room, sharing laughter and talking about their kids. A brief, educational video captioned in English was shown about Ramadan followed by a call to prayer. “We were received with great warmth, happiness and hugs, like we were going to a party,” said Maureen Storey, one of the Trinity guests. At nightfall, Nuray’s husband, Dr. Nasuhi Yurt ushered his family and guests into the dining room where they were served an enormous amount of dishes featuring a variety of Turkish foods including lamb, green lentil soup, salads, homemade lemonade, grape leaves, Turkish tea, figs stuffed with walnuts, and baklava. “Our hosts were cheerful about the meal, encouraging us to try the foods,” said Carol Droppa, another Trinity representative. For the first time in 25 years, Mr. Yurt’s parents were present for Ramadan, visiting from Turkey. The guests were amazed to discover that the grape leaves had been shipped to the U.S. from the family garden in Turkey. “Even in the midst of a divisive political climate, God is using this opportunity to bring people together,” said small group member Kathy Grimwood. Townsend likened the Ramadan fast to the Christian Lent, observing how sacramental the Islamic faith is. After dinner, the Trinity guests asked if they were imposing on the Muslim prayer time, unaware that throughout the meal, family members quietly excused themselves one at a time to pray in a humble effort to maintain both their hospitality and practice. Throughout the dinner conversation, Mr. Yurt emphasized the importance of people going out of their way to commune. “It all starts with people sitting around tables like these,” he said. The collective learning and experiences of the small group will be transmitted and moved into the larger church community on Sept. 25 when Trinity UMC will host an interfaith Friendship Luncheon with Peace Islands Institute.